To put it briefly, I have been devoted to translations... Unless I am working on a very urgent order, I always take the time to get an overall impression of the text first. I am trying to capture the main message and the means of expression used. Whether the text uses formal or informal language, I always do my best to ensure that it is easy to understand for its addressees. Let's take an easy example. If we hear a word collocation "hard rain" in English, it sounds rather unnatural to us. With a little effort, we can get its meaning, but we feel that the suitable English collocation here would be "heavy rain". As for the right Czech equivalent of this word collocation, we should say "silný déšť". A word phrase "těžký déšť" would sound similarly unnatural for Czechs as the English "hard rain". A good dictionary of English collocations is an indispensable aid in my work in which I can check the suitable phrases. My next steps then usually lead to the Internet – I am entering the word collocations into the search engine, trying to find out how (and how often) they appear on various British and American websites. To make the translation easier to understand, it is often desirable to modify the word order of some sentences. English shows significant affection for moving certain word elements to the beginning of a sentence – these are various kinds of adverbials as well as gerunds that replace subordinate clauses. It is quite a usual method in written English, greatly facilitating orientation in the text for the readers. 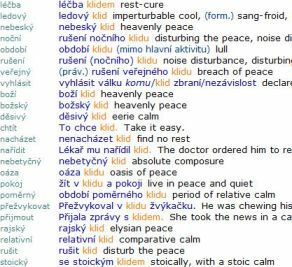 The Czech word order is, on the contrary, a little looser, which sometimes make it even more difficult to choose the best position of particular phrases. In this respect the translator's job can never be fully replaced by machine translation tools, such as Google Translate or Bing Translator. As regards to technical translations, it is vital to maintain the correct technical terminology. As a graduate of the humanities, I cannot claim to be an expert in the terminology of all the disciplines; however, I have quality translator's dictionaries at my disposal from the fields of technology, law, economics and medicine, in which I am able to look up the correct terms. If you are interested in translations of legal agreements or technical manuals for ordinary users, you need not worry to entrust me with the job. Your English-Czech as well as Czech-English translations will be in good hands with me. I will always provide you with a brief glossary of the terminology used and, in case of any doubt, I will try to consult the terms with you. However, it can make a difference if you demand a translation of a highly professional text that requires deeper insight in a respective field – in such a case you should better assign the translation to someone with an expert knowledge. The translation is not just a matter of correct word order, suitable collocations and proper technical terminology. It is also necessary to pay attention to correct spelling, punctuation and typography. When translating into English, we also have to use the proper verb tenses, definite/indefinite articles and other grammatical categories. But, in the first place, we have to bear in mind that the translation is never just a mechanical transfer from one language into another. An important part of my translator’s job is to avoid possible narrowing or broadening of the meaning of the original message. And last but not the least, I always try to compose the cultural differences of both the countries into the translation.